Killarney and its picturesque lakes and golf courses. How Can You Sell Killarney? Killarney is ”The” tourist spot in the whole of Ireland, let alone County Kerry. You can’t visit the south west of Ireland and not call to Killarney. During the summer months the volume of tourists causes it to be very congested. One of the main attractions is Saint Mary’s Cathedral with an incredible tall spire built in 1842. In the 18th century the cathedral was used as a hospital, and during The Famine it acted as a refuge for the destitute, the huge tree in front of the lawn marks the mass grave of those who died. Saint Mary’s and the Killarney National Park is a definite when you take a trip to County Kerry. At the east end of the town on Fair Hill is the fine gothic Franciscan church, which displays good decorative woodwork and an outstanding stained glass window. Opposite the Franciscan church is a memorial by Seamus Murphy to the Four Kerry Poets of the 17th and 18th century. The “Sky Woman” depicted by the monument is an allegorical symbol of Ireland. 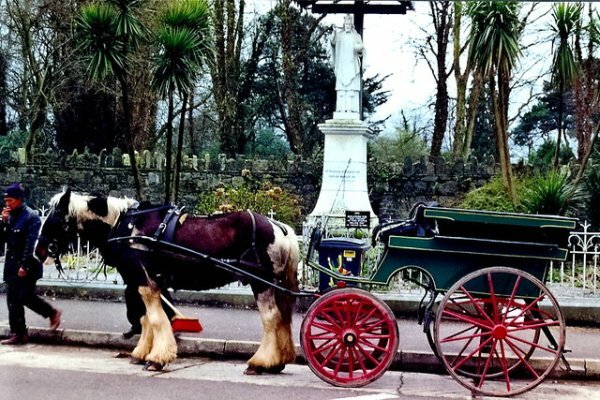 Sporting facilities in the town are numerous and transport by Jaunting Car is the way to see the whole of the Killarney surroundings. If you want to enjoy the full glory of Killarney on a reliable Jaunting Car booked for you; just send me an email and I’ll arrange it. Why not take a walk around Killarney and see the lakes, the forests, the hidden places that the normal tourist does not see. Contact Richard, Killarney`s foremost guide. Most of the areas famous Lake District forms the superb and extensive Muckross Estate, including Muckross Gardens, which lie 3km south of Killarney and form the centrepiece of the National Park. These gardens are particularly splendid when the azaleas and rhododendrons are blooming in May and June. The rock garden is considered one of the finest in Europe and the grounds are rich in sub-tropical exotics. Ruined Muckross Abbey, which was founded in the 15th century for Franciscan monks, is beautifully situated near the wooded shore of the lower lake. Although suppressed in 1542, the monks continued to reside in this Abbey until they were driven away by Elizabethan soldiers in 1589. The buildings were restored in 1626 and are considered to form the best-preserved example of ecclesiastical architecture in Ireland. Two of Killarney’s three main lakes occupy a large glacial depression at the foot of the mountains which rises south-west of the town, while the third lies in a valley which runs south west from the south end of the range. To the west of the lakes are MacGillicuddy`s Reeks, the dominant range of mountains in Kerry with the highest mountain in Ireland, Carrantouhill. For a more complete study of Killarney Lakes click on the link below. Where are the best pubs, where is the craic in Killarney? have you any stories about Killarney, if you have I would love to know about them and I will include them on this page, just email me at the link below, thanks, Tom. Need a place to rest your weary body for the night or a few days? Or have a try of one of these. Killarney: Ross Castle Lodge. : "Perfect". From a visitor from Island Height New Jersey. The best breakfast in Ireland, great dinner suggestions, room was bright and clean. Only Inn with a King Size Bed and big fluffy pillows. Fuchsia Guest House: "Hotel Standard B&B"A visitor from Bergerac France. I needed to make this mail to say what a wonderful time we had at Fuchsia House. Our rooms were very enjoyable, it was very peaceful and clean. The hostess was very informative and speaks French also. It was great also as my wife speaks German aand so does her husband Trevir. We have booked in for St Patricks Day and can`t wait. We also got really cheap flights from Beauvais in Paris to Shannon airport. Northwood House B&B: "Third Visit to Northwood House" From an Adelaide Australian. Northwood House is in a truly lovely location. Killarney can be quiet noisey in summer time. This house is in a nice quiet residential road allowing you to get a great nights sleep after a busy day. It also helps that the house has solid floors and staircase so no creaking floor boards to keep you awake. The owners are most helpfull, the views are great. The house is warm and inviting with an abundance of hot water. Northwood House B&B: “Best nights sleep in Ireland” Visitor from Middlesex England. Northwood House was beautifully decorated, clean and warm. In a nice quiet location. We had our best couple of nights sleep during our 6-week vacation. Josephine is a perfect host, always happy. Killarney is beautiful made all the better by our accommodation. This is the best place we stayed during our visit to Ireland. The peaceful and pleasant setting was a welcome relief from the hustle and bustle of a vibrant Killarney town. We stayed in the newer part of the property in a fantastic triple room and couldn’t believe the comfort, you could not ask for more. The bathrooms are large and feature a claw-footed tub for soaking your worn out exhausted body and a modern shower. The pastoral setting out of our balcony was exactly what you picture when you think of Ireland. We went to sleep each night listening to the soft baa of sheep. This was also the cleanest place I have ever stayed! The staff where constantly shining and dusting and keeping everything in order. I would recommend this to anyone wanting to treat themselves to a beautiful stay.